ART - just do it! 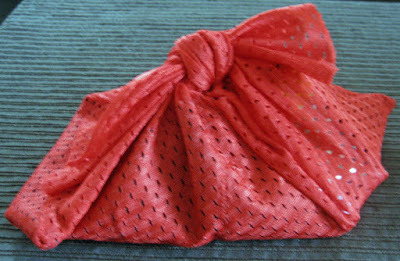 : REUSE - Hand decorated gift bags reusing banana bags!! 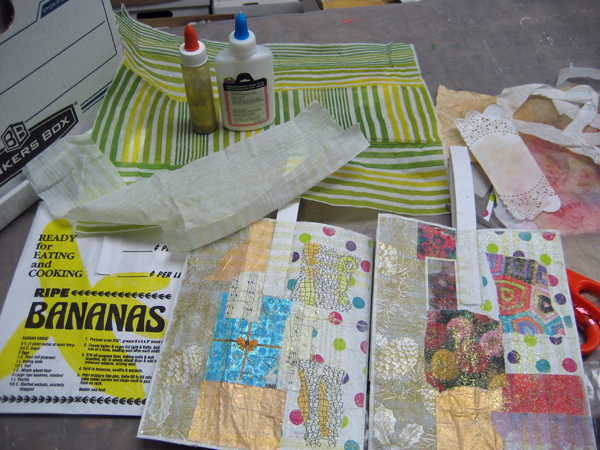 REUSE - Hand decorated gift bags reusing banana bags!! I needed some gift bags for Easter gifts this week and thought I would give a go to making my own from the bags that discounted bananas come in at the grocery store. I always keep these because they are really handy for packaging garden produce for passing onto neighbours and friends. So I dug a couple from my stash and decided I would create a bit of a collage on the front using scraps from my serendipity box. I used some thinned white glue to adhere all of my scraps to the front of the bags which nicely covered up all the writing on them. Wanting to unify the collage a bit I decided to glue a paper napkin (just the top layer) over my collage. You can see the napkin - green stipes - at the top of the photo. It was much to bold so I used the second to last layer of the paper napkin instead. You can see that it worked much better and the subtle pattern really allowed the collage to show through. I added layer of glue over the whole front and pressed the paper napking layer into it. For my last layer of glue I used some thinned gold glitter glue that I found in my glue bucket. Love the look!! Just a bit of nice glitter overall and the whole front is nicely sealed. On hindsight, the next time I will cover the handle on the front as well. For these ones, I will be adding some doodles on the handles to make them coordinate a bit better with the whole look of the bag. Very happy with how they turned out and I really enjoyed making these quick collages this morning! !